Incredible Array of Brooklands Photos! I came across a stunning archive of photos from the Brooklands race track in England. The track opened in 1907, the brainchild of Sir Hugh Fortescue Locke-King and survived until 1939 when World War II forced its closing. 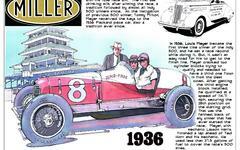 If you enjoy historic auto racing photos, you will love this collection.